What is a risk vs reward ratio? Investors accept risk because they believe the reward is worth it. The balance between the amount investors could lose, compared with the amount they could gain, is calculated as the risk vs reward ratio. Where have you heard about a risk vs reward ratio? It's a common way to evaluate investments. Savvy investors are aware of the risk vs reward ratio of all of their investments. 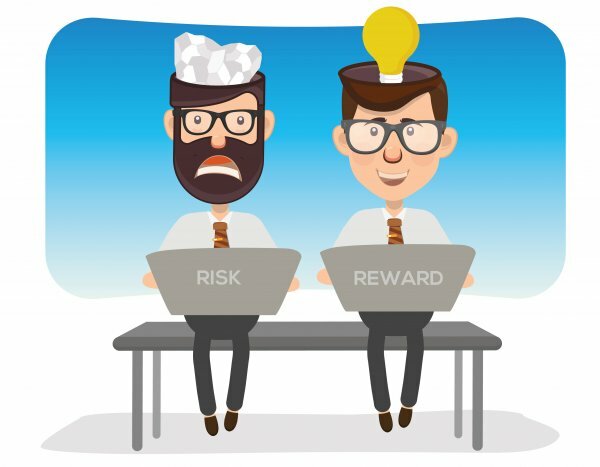 Most are looking for a minimum of 2:1 reward to risk or to double their money. First of all, an investor should work out the potential net profit (reward) of their investment. If they bought 100 shares at £1 a share because, after analysis, they thought the shares were likely to go up to £1.10 per share, their potential reward is £10 (100 shares x 10p). The total amount they have risked is £100. That's a ratio of 0.1:1 - not something many investors would go for. However, they are unlikely to lose all of their £100 because they would set themselves a minimum price point at which to close their position and stop their losses - say when the shares reached 90p. Then the ratio is 1:1. Why? Because the reward (10p) and the risk (10p) are now equal. It's best to improve a risk vs reward ratio by limiting risk, as with the example above, rather than by forgetting the analysis and aiming for a larger reward.